White Rabbit recognized by prestigious British hospitality industry trade journal, Restaurant Magazine. Moscow's White Rabbit has made an annual list of the world's top eateries published by prestigious British hospitality industry trade journal, Restaurant Magazine. A jury of nearly 1,000 industry experts from 27 different countries and regions placed it 23rd in a global listing, noting it as the "highest new entry." 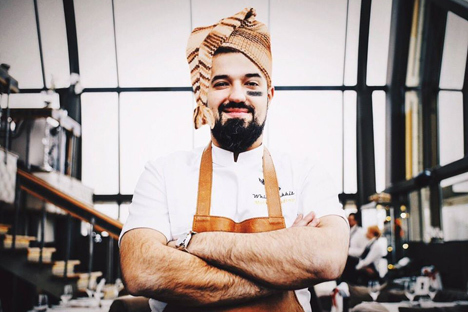 Vladimir Mukhin, White Rabbit's chef is lauded by the publication as one of “a new wave of Russian chefs," adding that he “is embracing the vast country’s amazing natural produce” and “claims to have borscht running in his veins”. “It was my dream to be included in this list because that really means we are one of the best restaurants in the world," Mukhin told RBTH. “A year ago we placed 71st. Since then we have worked a lot to improve our cuisine further, and now we are in the top 50." The move was nothing to do with luck, he added, but down to organization and good routine daily habits. Mukhin said he was sure White Rabbit would significantly benefit from being included in the list. “When we were first mentioned last year we saw an increase in the number of foreign customers. We are now serving more tourists than in the past." Sanctions and an embargo on EU food products that feature among regular ingredients in most Russian restaurants was not a problem for White Rabbit, Mukhin added. “We are using as many local ingredients as it possible; the embargo just helped accelerate a process in that direction." The world's top restaurant of 2015, according to the list is Spain's El Celler de Can Roca, a title it last held in 2013. Spain also has the highest number of eateries listed. The annual listing is keenly watched within the restaurant trade but has drawn flak this year for not including any restaurants from France in its top ten. British newspaper The Guardian said June 2 the listing had also been criticized for an alleged lack of transparency. Restaurant Magazine defended its voting mechanism. “The expert group is made up of food writers and critics, chefs, restaurateurs and highly regarded ‘gastronomes’," William Drew, Group editor of The World's 50 Best Restaurants told RBTH. “Members list their choices in order of preference, based on their best restaurant experiences of the previous 18 months. There is no pre-determined checklist of criteria, which helps to make the list as varied and open as possible”.